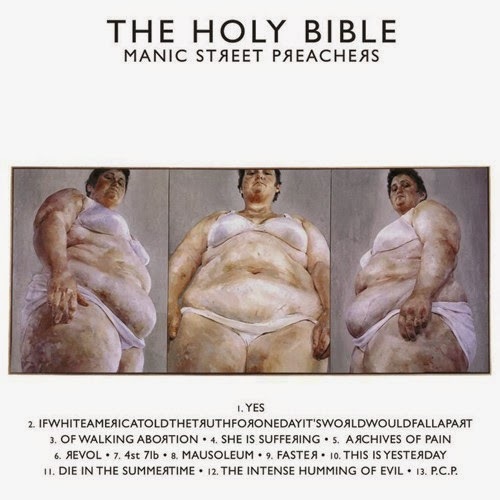 At 9am tomorrow morning, tickets go on-sale to a series of seven gigs that will see Manic Street Preachers perform their iconic 1994 album, The Holy Bible in full for the first time ever. This is huge. They’ve released 12 albums over the course of their long career (so much for splitting up after your debut album has changed the world, eh? ), but the Holy Bible remains their high watermark. Oh sure, they’re a much more accomplished band now than they ever were back then, but that album was the perfect storm: where the righteous fury, self-hatred and intelligence of their lyrics was met full on by the music. Around this time, James Dean Bradfield had the hardest job in the world – finding a way of shoe-horning those extraordinary lyrics into a tune and then actually singing them. Listening to “Yes”, I’m not sure where he finds the time to breath. I hurt myself to get pain out. What an extraordinary lyric. Of course, 70% of these lyrics were written by Richey, and on 1st February 1995, a few short months after the release of the album, Richey disappeared, never to be seen again and presumed dead through suicide. These lyrics are an often uncomfortable insight into his state of mind at the time. Richey was, what, 24 years old when he wrote that. I can’t think of any other set of lyrics that are quite as consistently astonishing as the ones on this single record. I saw the Manics performing many of the songs from this album when they played the Reading festival in 1994. The album was released that Monday, and I tried to buy it on the way home from the festival, but as it was a bank holiday in England in the 1990s, all of the shops were shut and I had to wait. When I was in Venice at the end of that year for four months as part of my degree, I used to listen to it on cassette on my Walkman as I wandered back across the city to my room in the small hours of the morning, with the city completely to myself and this extraordinary album for company. I really hope I can get some tickets.